In 1941 our world was in trouble. A crazed dictator and his vicious war machine were trampling the freedoms and lives of millions. World War Two had come to America. A half a world away, in the city of Indianapolis, a skinny kid named Elmer Ellsworth Robison – my dad – decided to join thousands of other patriotic young American boys determined to roll up their sleeves and do something about it. Well, that was like saying “sic ‘em” to a dog. You see, Elmer had a streak of determination steeled by a Depression-era childhood. His father had suffered a stroke at the depths of the Depression, drying up the family income stream. Young Elmer used to walk the alleys picking up chunks of coal left behind by the coal truck just to provide his family a few more degrees of heat at night. He was acquainted with hunger. He knew hard times. He relished challenges. So when the recruiter issued a challenge to bulk up or stay at home, Elmer signed up at Hofmeister’s Gym and began a weight training program that launched a lifetime of physical fitness training. While bulking up he took a job in Indianapolis where he met a gorgeous young lady named Maxine Reasoner. She was a church organist, so Elmer found himself attending Sunday evening services in hopes of escorting her home. Their love for each other blossomed in the ensuing months as did his biceps and subsequently his chances of getting to serve his country. 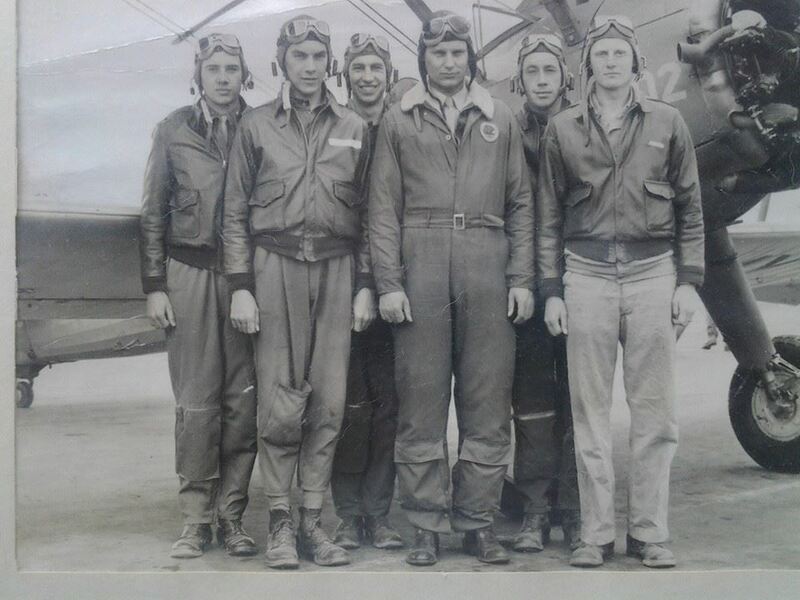 He was accepted into the Army Air Forces on September 16th, 1942. Just before shipping out for the European war front he presented Maxine with a sparkling engagement ring. After rigorous flight training Elmer Ellsworth Robison became 2nd Lt. Robison, receiving his wings as a pilot that same day. At last his dream of fighting for his country was about to take flight. His first of 30 missions during World War Two was a bombing raid over Nidda Airfield in Germany. On Christmas Eve, 1944 my dad strapped himself into the cockpit of a B-17, appropriately known as The Flying Fortress, 50,000 pounds of fighting-mad steel and guns, ready to take on Hitler and his cronies. This first mission and his next few were in support of The Battle of the Bulge, the last gasp offensive of the German forces under General VonRundstedt. Over a million men fought in this great battle. 81,000 U.S. casualties and 100,000 German casualties resulted during those terrible few days when good and evil clashed in a struggle to determine the future of democracy and freedom. They say that the winter of ’44 and ’45 was the worst in a half century. When Lt. Robison lined up his Flying Fortress that Christmas Eve day for his first mission, the fog was a thick blanket of white blindness daring him to face it down. Even though it was daytime, flare pots lined each side of the runway – his only guidance in an otherwise sightless takeoff. With the flick of a few switches the engines roared to life and the Fortress lurched forward down the runway. Within seconds an icy glaze covered the windshield rendering forward vision impossible. With his left hand on the control column, Lt. Robison leaned forward, using his right hand to wipe away the glaze. Ice and snow forced the massive plane to slip to the left. The main landing gear struck the flare pots in rapid-fire succession. The thump, thump, thump of the flare pots signaled deadly trouble as they approached the end of the runway, now just yards away. Still 5 miles per hour slower than take-off speed, the end of the runway screamed toward them. Two choices – pull up now or crash. Lt. Robison rammed back the stick, the plane nosed up, staggering into the air. The remaining flares quickly disappeared from sight, leaving the plane and its crew enveloped in a mantle of fog. Seconds seemed to drag like minutes as the crew held their breaths. Then, suddenly, the nose of the Flying Fortress punched through the top of the fog bank into a brilliant sunlit day, leaving behind a creamy white blanket below. After dropping their bomb load over the Nazi airbase, they headed back to the U.S. base in England. But the fog forced them to divert to a British airbase. Climbing down from the cockpit, the historic bitter cold greeted the crew. They were allotted a literal handful of coal to heat their large room that night, no doubt reminding Elmer of frigid childhood nights. The crew sat around an upright piano singing into the evening. It was Christmas Eve, and they had done their duty to bring peace on Earth. On another bombing raid Dad’s plane was spotted by the German army. Flack bombs exploded all around them, shards of hot metal tearing through the metal skin of his B-17. One piece shot through the narrow space between his co-pilot and him, missing them by inches, bounced around inside the top gun turret and the gunner, then dropped to the floor. When they landed the crew got out and counted the flack holes. There were 27, but no injuries. Following the war Mom and Dad got married. A couple of little Baby-boomers named Donna and Rodney came along a few years later. Dad went off to the Korean War to fight Communism shortly before I was born. Donna and I grew up on various airbases during the Cold War when the threat of Communism hung over the Western World. In the 60s Dad was aircraft commander of a mighty KC-135, a giant gas station in the sky that refueled bombers and fighters at 35,000 feet while maintaining a speed of 600 miles per hour. The next time you refuel your car get a vision of that delicate job. On April 15th, 1965, a day I’ll never forget because I was so proud of my dad, Major Elmer Robison became Lt. Colonel Robison and retired from the Air Force. Dad used to say in his latter years that the reason veterans seldom speak of their war experiences is because so few care to ask. We’re losing hundreds of World War II veterans each day. Few of us have a clue what they went through to secure the freedoms that you and I take for granted, maybe simply because we never stopped long enough to ask and to thank them for their sacrifice. My dad was a patriot. He loved America. A few days after the great 9/11 tragedy I came to Dallas to surprise Dad for his 80th birthday. Donna had crafted for him a gorgeous tribute book full of memories including those of his military days. As he paged through the book he began to talk about the invasion of our country by terrorists just days before. And he began to weep. I’d never seen my dad weep before. I’m sure he wept for the thousands who were killed that day, but I suspect it was even more because the country he defended so many years ago had been violated. The freedom he fought to protect was again being threatened. But this time there was little he could do to fight back. Dad passed away in 2004. But he left behind a legacy that my sister and I now pass on to our children and grandchildren. Each of us Baby-boomers has been handed that same legacy, offered to us through the sacrifice and courage of The Greatest Generation. Most of us will never have to face the kinds of hardships that generation not only faced, but took on as their sacred duty. The very least we can do is pass their stories, their values, their patriotism and their courage on to the next generation.